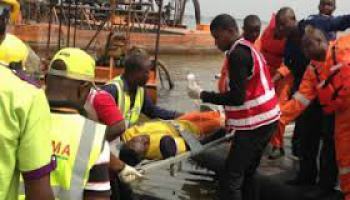 One person has been confirmed dead and 19 others have been injured as a boat conveying over 20 passengers capsized on Lagos waterways on Tuesday. The boat was said to have capsized on the 3rd Mainland Bridge axis of the waterways. Those rescued had been rushed to the Ebute-Ero Jetty while the search for the remaining victims was still ongoing. The passenger who lost his life in the mishap was said to have sunk with the carcass of the boat while investigations still ongoing to unravel the cause of the accident. The Managing Director, Lagos State Waterways Authority, Damilola Emmanuel confirmed the death of the passenger. Emmanuel said that strict enforcement will be meticulously carried out across the State. He said that the Government would stop at nothing to ensure that operators adhere to the safety standards. The Lagos State Government had last Wednesday said that it has stepped up efforts to clamp down on illegal jetty and boat operators in the State in a renewed effort to stem the tide of boat mishaps often caused by illegal operations on the inland waterways.